PLYMOUTH, Wis., March 13, 2018 /PRNewswire/ — Service One Transportation, a leading Wisconsin trucking and logistics company, salutes veterans of the U.S. Armed Forces with new custom-wrapped graphics on two of the Kenworth truckload vehicles in its fleet. One truck boasts a military camouflage pattern and the other is emblazoned with the Stars and Stripes, while the rear of each cab features a tribute to Service One family members who served with honor in the military. 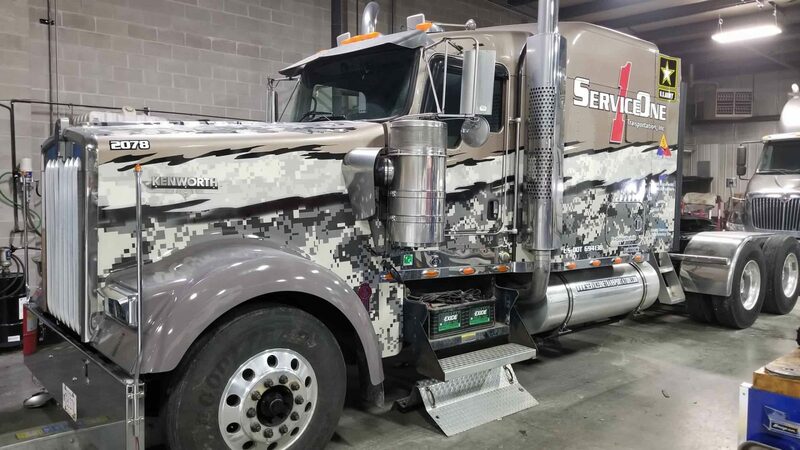 Service One Transportation, a leading Wisconsin trucking and logistics company, salutes veterans of the U.S. Armed Forces with new custom-wrapped graphics on two of the Kenworth truckload vehicles in its fleet. Daniel Flagstad, U.S. Army, Cold War Veteran – Service One founder Dan Sr. joined the Army after graduating high school in 1955, and spent four years in Germany during its reconstruction era following World War II. Edward Kawczynski, U.S. Army, 36th Infantry Division – As a member of the “Arrowhead” Lone Star Division, Myszewski’s father-in-law, Ed, served in battle throughout Italy, Southern France and Germany. He earned several decorations, including the Bronze Star Medal for valor, but was most proud of his Combat Infantry Badge. Dale Mueller, U.S. Marine Corp, 3rd Marine Aircraft Wing – Dale is the husband of Service One’s office manager, Diane Mueller, and served during the Vietnam War. His wing squadron was deployed to provide the aviation combat element for the I Marine Expeditionary Force during battle in Southeast Asia. Wayne Neumann, U.S. Army, 11th Airborne Division – Wayne was a Korean War veteran and the father of Service One’s controller, Wayne Jr. He served in multiple combat units, including the 3rd Armored Division, the 5th Infantry Regiment and, most notably, the 11th Airborne Division. Michael Strysick, U.S. Army, 6th Armored Division – A veteran of the Korean War, Michael served in the 6th Armored Division from 1952–1953. This division, known as the “Super Sixth,” was formed during World War II and subsequently reactivated during the Korean conflict. Michael’s son, Service One truck driver Peter Strysick, will be driving the custom-wrapped vehicle that bears his father’s name. Headquartered outside Plymouth, Wisconsin, Service One Transportation offers a full range of trucking and logistic services—including truckload, volume less than truckload (LTL) and expedited shipping—throughout the 48 contiguous United States and all Canadian provinces. Dan Flagstad, Sr. founded Service One in 1997 with a single truck; today, Dan Flagstad, Jr. oversees the family-owned and operated business, which now employs more than 50 drivers. The Wisconsin trucking company has earned a reputation for unsurpassed customer service and is dedicated to “doing whatever it takes to get the job done right.” Service One is also highly regarded among drivers, offering excellent pay, full benefits and a “family-first” culture that ensures a proper balance between work and family time. For more information on Service One Transportation and its trucking, warehousing, logistics and supply chain solutions, visit https://www.serviceonetransportation.com.